Rated 4.6 out of 5 stars.1768 total votes. Bring cute, casual seating to your living room or den with this playful pouf! 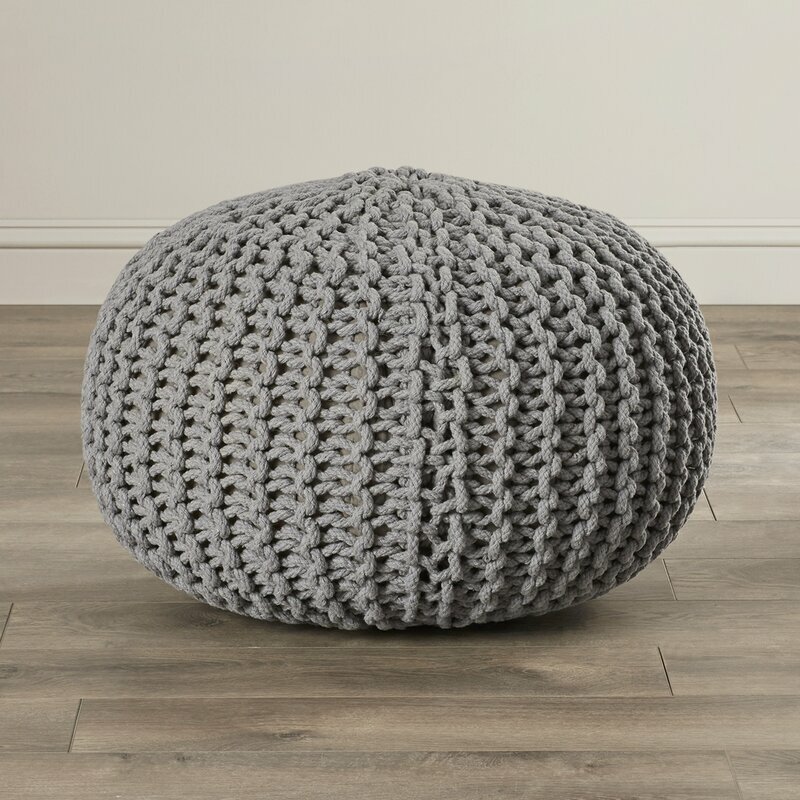 Handcrafted from 100% polyester, this lovely pouf strikes a spherical silhouette featuring a chunky knit outer shell for a welcome touch of texture, while polystyrene bead fill offers softness and support. When you buy a Mistana Grimes Pouf online from Wayfair, we make it as easy as possible for you to find out when your product will be delivered. Read customer reviews and common Questions and Answers for Mistana Part #: MTNA2948 on this page. If you have any questions about your purchase or any other product for sale, our customer service representatives are available to help. Whether you just want to buy a Mistana Grimes Pouf or shop for your entire home, Wayfair has a zillion things home. We love these poufs (ottomans). They are great as footstools, extra seating, and for sitting in front of the fire. My kids love them, too, for sitting around the coffee table playing games or doing puzzles. I can't neglect to mention that they were a great deal! We love Wayfair! I love!!! Good quality!!! Thanks!! My living room has a lot of blue and all the seating was on one side so I bought 2 of these in orange to balance the seating and add a pop of color. The orange is a really nice color -- like a burnt orange, not bright. They are firm to sit on and a little heavier then other similar pouf's which I think adds some stability. Love these ottomans! I've bought numerous items from Way fair, & love their products & customer service. I love the size of these & the fact that their stiff & sturdy to be used as an actual seat. My son loves them! The only reason I didnt give 5 stars is that one of the ottomans arrived 3-4 days after the first. This was fine, but you could tell they both came from a different batch. Coloring & size do not completely match. Other than that, I'm happy. I posted a picture with my 3 year old next to one so you can get an idea of actual size. I love this pouf! Came exactly as described- it's much lighter than I had expected though and I will have to see if it will hold its shape long term but it's the perfect addition to my living room. The photo and information provided in the Q & A is deceptive: the rope is not woven as thickly as depicted in the photo, the fabric cover underneath is clearly visible. What bothers me more is that Wayfair staff state that the stuffing is 100% cotton, which is the main reason why I selected this item. This is untrue. The attached label lists polystyrene as the filling. If Wayfair is providing misinformation on the the products they sell, I cannot trust them with my future purchases. I purchased this item in orange. Love the color it is bright but a little darker like a burnt orange. I bought this to pair with a glider. It is the perfect size for a foot rest and sturdy enough to sit on. I love this item and I might buy another for my family room in a different color. This Ottoman is the perfect compliment to my monochromatic color scheme. It's very firm and can also be used as a seat without losing it's shape. Very nice quality for the price! These arrived today and they are absolutely perfect!!! My kids thought they added some fun seating to the living room. My husband liked the versatility and design of these sturdy ottomans. Therefore, the whole family gave gave this purchase the seal of approval. Rated 4 out of 5 stars.35 total votes. Doubling as a spare seat and a place to kick up your feet, this petite pouf is a versatile addition to any arrangement in your home. Though its small size and neutral hues may make it seem understated at first, this design features a hand-knit, woven cover for a tastefully textured look. Polyester beads fill this piece for a bit of cushioning as you take a seat. Bring cute, casual seating to your living room or den with this playful pouf! Crafted from 100% wool felt, this lovely pouf strikes a spherical silhouette featuring a chunky knit outer shell for a welcome touch of texture, while polystyrene bean fill provides comfort and support. Measuring 18" H x 18" W x 18" D overall, this pouf makes a perfect ottoman, or can be pulled out for extra seating at your next soiree. 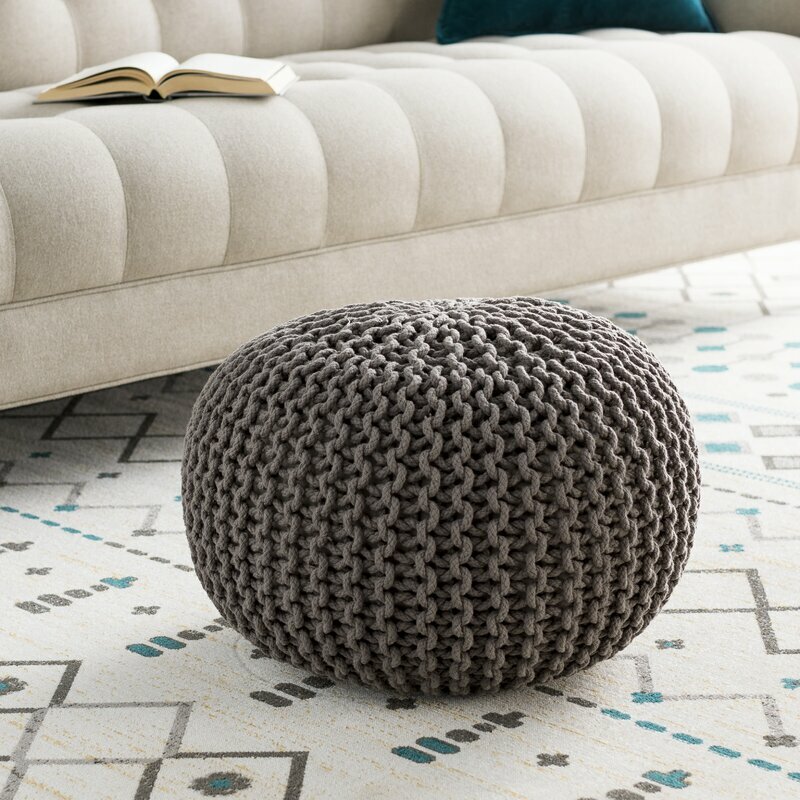 If your room needs a little seat somewhere this Garst Knitted Pouf is the perfect addition to any room. Rated 3 out of 5 stars.14 total votes. This chic, elegant 18" Round Pouf Ottoman makes for a beautiful addition to your bedroom or living room décor. Handmade sphere pouf. The captivating cable knit design laced with a pop of pristine color will flawlessly fashion a sense of subtly sweet sophistication from room to room within any home decor. Genuinely faultless in aspects of construction and style, this piece embodies impeccable artistry while maintaining principles of affordability and durable design, making it the ideal accessory for your decor. This Crantor Fabric Pouf Ottoman is a wonderful way to not only add a splash of color to your home but the splash of youth as well. This pouf is the perfect size for resting your feet after a long day at work or to use as an impromptu seat at your next party. You can also place it in your kid’s room as a fun seat for them to use all year round. Need a little seat somewhere….this Pouf is the perfect addition to any room. Soft 100% polyester knitted texture will comfort your bum or be a nice accent of color in your room. Great for extra seating for small apartments, dorm rooms, kids rooms, anywhere you need a little sit-down. Rated 4 out of 5 stars.317 total votes. Perfect for kicking your feet up in the den or offering a spare seat at your next soiree, this posh pouf brings both fashion and function to your space. Measuring 14'' H x 20'' W x 20'' D, this design takes on a fun round silhouette. Its woven cover is crafted from 100% cotton, featuring a solid hue and a textured design sure to draw the eye. No assembly required.